The 2019 National Organic Chemistry Symposium to be held Sunday, June 23 to Thursday, June 27, 2019 on the Indiana University, Bloomington. The lectures will be in the Alumni Hall. This page provides details to help individuals make their travel arrangements. A tentative schedule for the symposium includes registration is currently scheduled to open at 3 PM on June 23rd, 2018 and a Poster session will be held that evening (at 8 PM). The last talk is tentatively scheduled to end at 12:15 PM on Thursday June 27th. Information for the local area can be found on the Visit Bloomington website. For getting around campus, please see the interactive campus map. A virtual tour of campus is also available. Some international participants will require a visa prior to arriving in this country. Please check the website of the US State Department for detailed information. If your entry to the U.S. requires a visa, you are encouraged to apply as soon as possible. If you need a formal letter of invitation from the meeting organizers as part of the visa application, please contact Professor Kevin Brown: (brownmkb@indiana.edu). If you are requesting a letter of invitation, be sure to include your name, address, and poster title. The closest airport is Indianapolis International Airport (IND). 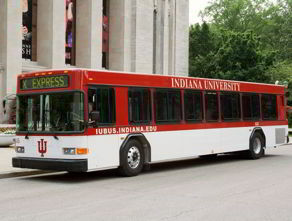 GO Express Travel, (800) 589-6004, travels between Indianapolis International Airport and Bloomington several times each day. They also have private cars and a shuttle to and from Chicagoland. Embarque, (800) 888-4639, and Classic Touch Limousine, (800) 319-0082, offer private, chauffeured cars and limos. As information becomes available, it will be posted here.